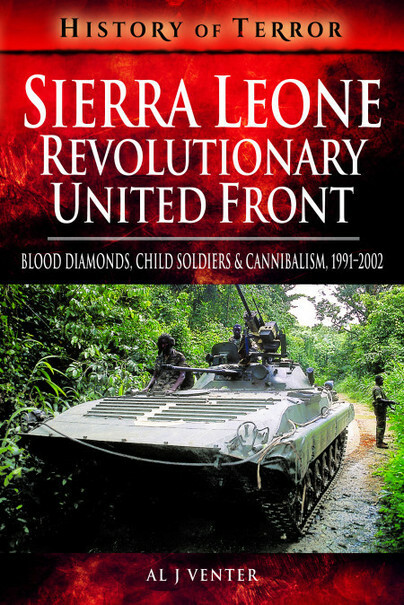 You'll be £7.79 closer to your next £10.00 credit when you purchase Sierra Leone: Revolutionary United Front. What's this? Sierra Leone’s eleven-year guerrilla war – that left 200,000 people dead – was brief, bloody and mindlessly brutal. It was also the second African war in which mercenaries were hired to counter some of the worst atrocities that Africa had on offer. By the time it ended in 2002, several groups of mercenaries – including an air wing equipped with a pair of ageing Mi-24 helicopter gunships and backed by the British Army and the Royal Navy – played significant roles in quelling the bush rebellion. It was an idiosyncratic war, which started with the Foday Sankoh’s Revolutionary United Front (RUF) chanting the slogan ‘No more slaves, no more masters, power and wealth to the people’ and ended with a series of battles for control for Sierra Leone’s diamond mines in the interior. By then the Liberian tyrant Charles Taylor and Libya’s Muammar Gadaffi were the prime movers for the rebel cause, one of the reasons why anyone deemed to be the enemy – doctors, journalists, civil servants, missionaries, nuns and teachers – was slaughtered. The war gradually deteriorated into some of the most barbaric violence seen in any African struggle and which sometimes included cannibalism, with an army of 11,000 child soldiers – some as young as nine or ten – high on drugs rounding up entire neighbourhoods to machine-gun them en masse or burn them alive in their homes. Amputations of limbs of women, the very young and the very old were commonplace.